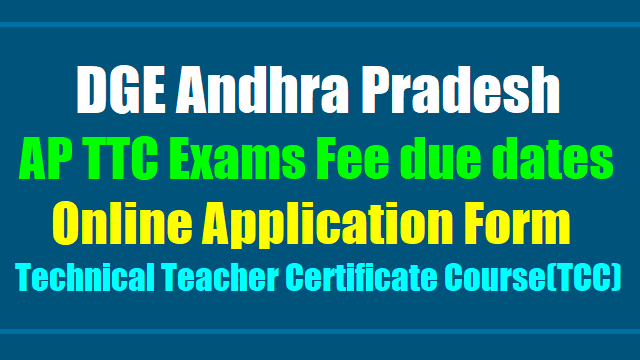 AP Technical Teacher Certificate Course(TCC)/TTC Exams Fee due dates, Web application form 2017: Technical Certificate Course(TCC) Exams Fee due dates, Online application form 2017,TTC Exam fee dates, TTC Exam Fee Online Application form, AP TTC/Technical Teacher's Certificate Course Exam fee details, Drawing TTC Exam fee Notfication Tailoring Exam fee Notification, Handloom Weaving Exam fee Notification, Drawing Tailoring Handloom Weaving Exam fee Notification,TTC Trades/TCC Trades Exam fee notification, Drawing Lower, Drawing Higher, Handloom Weaving Lower, Handloom Weaving Higher, Tailoring Lower, Tailoring Higher Course Exam fee notification. AP TCC (Lower & Higher) Exams 2018 fee dates. DGE Andhra Pradesh - Rc.No.314: It is hereby notified that the Technical Certificate Course Examination in Lower and Higher Grades in Drawing and Tailoring, Handloom Weaving & Embroidery will be held in the month of January, 2018 at the identified centres in all the (13) Districts of Andhra Pradesh State. The candidates who have passed VII Class Examination are eligible to appear for Lower Grade Examination -in the above Trades and those who have passed Lower Grade Technical Examination (or) equivalent to lower grade exam are eligible to appear Higher Grade Examination in the concerned Trade. The candidates desiring to appear for these examinations should apply through ONLINE in our website i.e., www.bse.ap.gov.in and submit their down loaded web application forms at concerned District Educational Officer. 7. Candidates coming up from outside the State should obtain prior permission of Director of Government Exams, Andhra Pradesh, Vijayawada for appearing Technical Certificate Course Exams before paying the examination fee. 8. Intimation to the candidates consisting of date of examination, venue of the centre, Roll. No. etc., will be hosted on the website www.bse.ap.gov.in 4 to 5 days earlier from the commencement of Examination. 4. Last Date for submission of Application forms and NominalRolls by the DEOs to the DGE 06.12.18. 3. Download ‘Instructions for online application’ and go through the instructions. 1. The candidate shall opt Telugu/English Medium only. passed Lower grade or equivalent Examination in concerned trade (attested copies should be furnished). 3. His / Her recent black and white passport size photo to be scanned and uploaded. 4. His / Her signature to be uploaded. Is there any notifications regarding art,craft or tailoring teachers in ap gov schools ?